There's a good reason why this odd-wall space issue bothers you: you know instinctively that the space is incomplete without art, but there seems to be no easy solution. There is a simple solution, and I will show you how. First, I need to refer you to the blog I wrote earlier about #largeart for large walls. Please read that article after finishing this one to understand my methods on choosing art that suits your style. You will know where I am coming from for the next steps that I suggest, and hopefully you will see that those #oddshapedwalls will present great opportunity for you to show something that's beautiful AND tells your story. Those odd-shaped walls are that way because they are a piece of a bigger environment. They are providing a function of some kind. 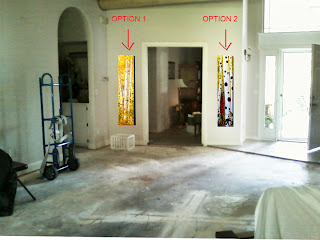 Those walls are often next to doors or windows, alcoves or entries, and require unique wall areas to make those features work properly. You need to be aware of what else you have going on in that overall space and then work from there. • Do you already have a theme developed in that space? • Are there unique angles, shapes, or textures in that space? It helps a great deal to have a feel for the "big picture" of that space first. To do this, you need to get a feel for what sizes will "seat in" comfortably to your eye. There is an interesting phenomenon in the typography world that has application in the painting-to-wall space world. It might have a name ... I don't know what that is ... but I just know THAT it is. Your wall spaces have a ratio of comfort, too. There is the dimensions top to bottom, side to side, that you have to work with, and then you are placing into that space something that must fit in that wall space comfortably. That can be tough to grasp. Simply cut a newspaper to different sizes and try them one by one by taping them up. Tape sections together, or cut down pages that you think will come close to a fit. Look at height, width, and placement on the wall for the best level of comfort for you. If your odd-sized wall is narrow, you will be toying with the idea of either one long, narrow piece or several smaller pieces stacked on top if each other. Think of this step as your most creative step ... you are having a good time while you begin to solve your decoration frustration. You didn't realize you had those sizing options, did you! If you already have something up on more dominant wall spaces, work with the theme or color scheme that's already started. One good way to do this is to consider the minor colors in a larger piece and make that your dominant color in your odd-shaped piece. It works well and doesn't become repetitive. Narrow pieces can be a nice connectors from one side if the space to the other. Often, narrow wall spaces are what you are working with on both sides of a door, a window, etc. this creates the opportunity to "bookend" the door or window which further unifies the total space. This one can be challenging, but there just might be a great solution in a piece that you will love that's waiting for you to find it. That can be part of the fun, and it would support the work of an artist that would appreciate your support. Your local art supply store such as Hobby Lobby or Michaels will have stretcher bars at many different lengths. Simply buy two of each length that comes closest to your measured size. Then buy a canvas sheet that will fit the space you need (plus a bit extra so you have more canvas to pull on so the canvas will be easier to stretch tight. Then just staple the canvas to the wooden stretcher bars. There are many how-to videos on YouTube that shows you the process. Then, you can paint whatever best-suits your taste in design and color, frame it and hang it. Also, nowadays, there are wooden panels that come in odd sizes that can be purchased at the art supply stores. Not all artist are alike, and there are some ... like me ... who can create paintings to any size. Again, what you see of an artist's work in a gallery can sometimes be done to your odd-sized art specifications. What I do is walk you through the process I've outlined, and the complete the rendering process I described in my previous blog on Large Art for Large Walls. The benefit here is that usually, when commissioning a custom piece, the artist does the legwork of securing the canvas or panel at exactly the right size. Above all, your smart approach to resolving this design challenge can allow you a new place to tell your story. Do you have any odd-sized walls that need artwork upgrade? Please contact me and let me show you how painless and even fun solving this problem can be!